Can you bear to bare your mistakes? 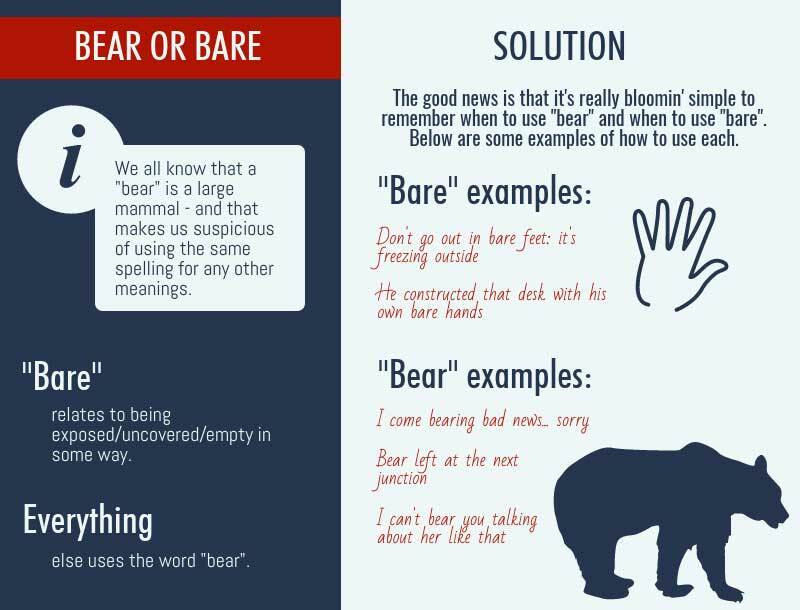 We all know that a “bear” is a large mammal – and that makes us suspicious of using the same spelling for any other meanings. "Bare" relates to being exposed/uncovered/empty in some way. EVERYTHING else uses the word "bear". I just bared my soul to you… and that’s what you say in return?? E.g. and i.e. are not the same. 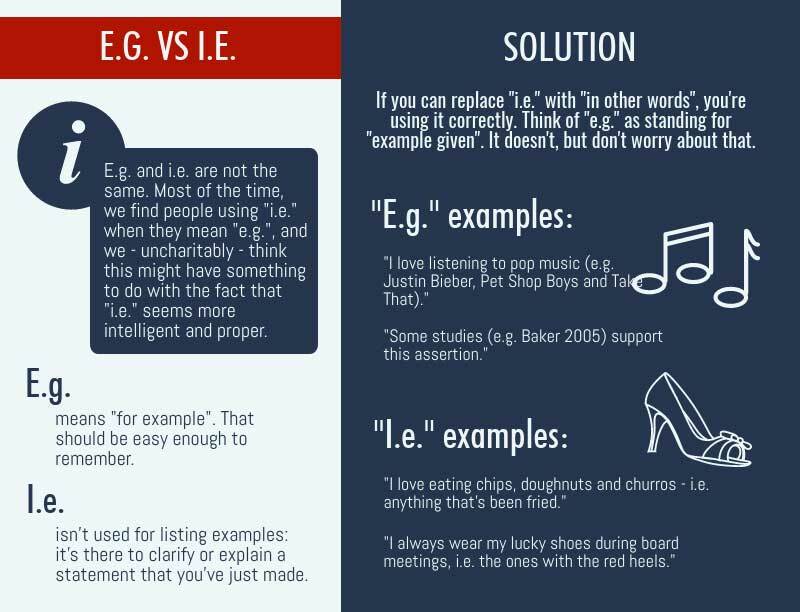 Most of the time, we find people using “i.e.” when they mean “e.g.”, and we – uncharitably – think this might have something to do with the fact that “i.e.” seems more intelligent and proper. After all, schoolkids use “e.g.”. Only adults doing important work know how to use “i.e.”. Unfortunately, they usually don’t. In case you’re interested, “i.e.” originates from the Latin “id est” (meaning: “that is to say”), while “e.g.” originates from the Latin “exampli gratia” (meaning: “for example”). I love listening to pop music (e.g. Justin Bieber, Pet Shop Boys and Take That). Some studies (e.g. Baker 2005) support this assertion. I love eating chips, doughnuts and churros – i.e. anything that’s been fried. I always wear my lucky shoes during board meetings, i.e. the ones with the red heels. The service charge is included (i.e. you don’t have to leave a tip). If you’re ever stuck, try replacing the abbreviations with their real meanings and see if the sentence still works. “Utilise” is another of those words that people opt for because the shorter variant, “use”, seems a bit too… well, easy. Amateur. Unprofessional. “We were unable to utilise the new computers” would mean “We couldn’t find a way to make good or effective use of the new computers”. “We were unable to use the new computers” would mean “We couldn’t figure out how to turn the darn things on”. BUT (big but!) no one really pays attention to this subtle difference anymore, and most style guides simply that agree that “utilise” is a pompous, unnecessary way to say “use”. In Eric Partridge’s book, Usage and Abusage, he says: “[utilise] is, 99 times out of 100, much inferior to use; the other one time it is merely inferior”.